Lapdog Creations: Monday Mischief: Antlers and Cake? Everyone tried the antlers on, but I only managed a couple of quickie cell phone shots of Zeus and Tut (notice Lola glaring in the background). Despite the protest, we will have an antler photo shoot late this week. As if that wasn't enough human mischief for one weekend, the next day they we had the nerve to go out without the kids again... and we got to visit foster baby Lambchop (yes, I do still owe you an official Lamby post... she was with us for less than one week before finding her forever home in Maine)! ﻿I am so happy to report that shy little Lambchop is doing wonderful and has settled in very nicely with her forever family! It's been two weeks since they picked her up and we were so excited to see her, as she was to see us! 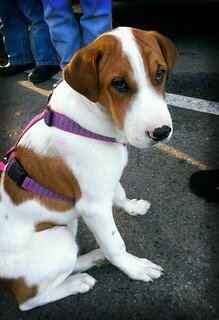 She's already getting bigger and is now sporting a really pretty new pink and purple harness... such a chic little girl! I do miss that adorable little nose and super sweet face, but am so happy that she found a perfect forever home with 2 boys to play ball and wrestle with. They are clearly so happy to have a pup to grow up with -- a win, win for everyone! Happy birthday to Sophie and we bet a great time was had. Have a marvelous Monday. Yes we all understand your impulse buy. We all need something new to torture the pups with at holiday time. That looks like a great birthday celebration. We can't wait for all the photos. Well happy birthday Sophie!! Yea we all have to endure the antlers. If only it was just once, but for me it is almost a daily thing. sheeesh. Well, guys...I gave up fighting the silly hats and head gear and it really works out well for mom and I. I just wear what she puts on me for a few minutes, she does her pics, she is happy, I get snuggles and I am back on my way - maybe you should give it a try. Stopping by from the blog hop to say woof! First time stumbling to your blog! Nice to meet you! Happy birthday Sophie and we love all the antler pictures.